Ever since I was a kid playing poker with my best friend on the roof of her chicken coop, I've wanted to raise chickens. Unfortunetly, my mom didn't. And when I grew up, I lived in a series of appartments. No love for the chickens there. I moved to Texas and suddenly had a yard. A good sized yard. 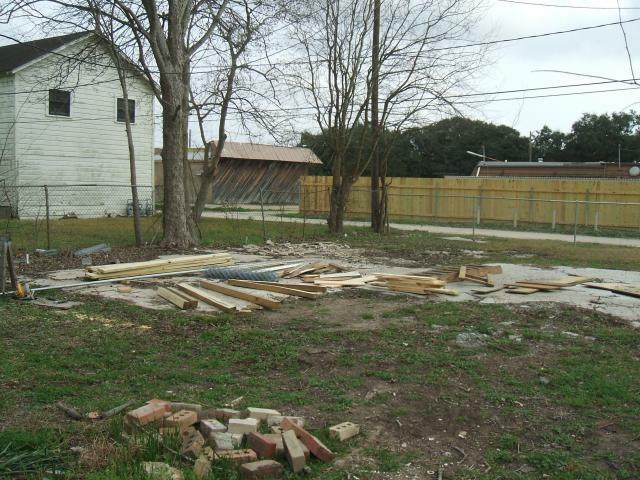 It had been neglected for years, and the back yard was covered in broken glass, due to it being the former location of a glass company. I've spent the last two years planning, and now I get to have chickens! 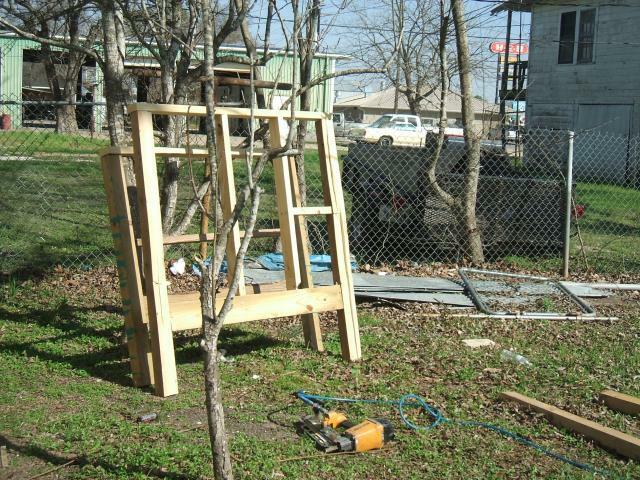 We had a bit of left over lumber from the remodel, so I set to work planning. Here's what I've got so far. This is what I had to work with. 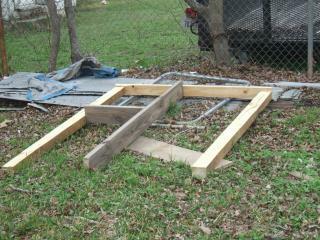 Sans the railroad ties that I'm planning on using for the seal around the bottom of the coop and run. The coop will be sitting part of the concrete slab. The dirt area is too low and occasionally floods and is littered with bits of glass. Both standard and auto. I simply can't get rid of all of it. I will be filling the run with 4 inches of sand to keep the chickens off the cement and away from the glass. Here we are today! The coop area is mostly assembled, but I can progress no farther today, as I have to get the railroad ties before I can set up the run and put the roof on. 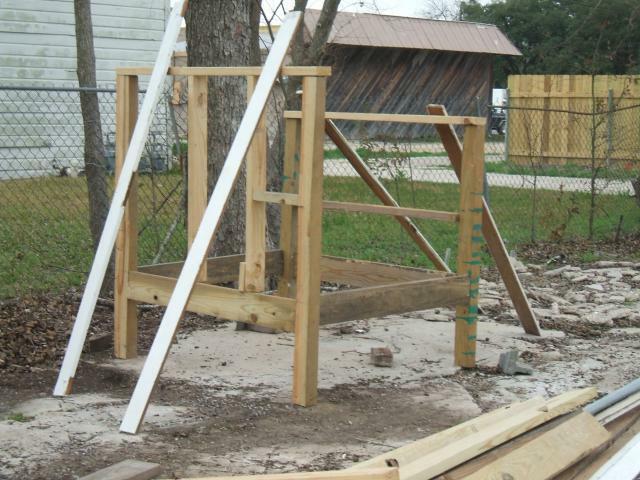 We got the railroad ties and here's what I did the next day. I set up the roofline and braced the walls. Unfortunetly, It seems I've never been introduced to the level, and the center wall isn't plumb. Oops. Oh well. Good enough for chickens and my first try. Here I've got the roof set up and I'm ready to start putting in things like floors and doors. My chicks arrived and progress stalled a bit while I was doting on the little fuzzy butts, but after a couple of weeks, they learned that they can peck their way through wet carboard, so they set about making the cardboard very wet and got out. Time got get my arse in gear and get the coop done. And here are the girls enjoying the great 'outdoors'. I'm using dead leaves as bedding in the run. The girls like to scratch around looking for bugs. I can't see all of the pictures but from what I can see and read, your coop sounds very nice! We’ve been trying to find a way to restore the missing pics to this article but haven’t had any luck. Hopefully the author will be able to help us get the pics loaded back up!